AS OF DECEMBER 2018, we have conferred high school diplomas on 1,060 people, the majority women. Our rector, our executive director, our computer teacher, and most of our other teachers are women, who model leadership for all students. Empowering women transforms the world. Our School has rescued many women who got pregnant as girls and became single mothers very young and thought their lives would be over. Women who get help in raising their voices, their self-esteem, and their status, change their own futures and improve their families’ life chances in every way. Almost half out graduates are rural. Our students receive an excellent education not only in the academic subjects but also in computer skills, social skills, verbal ability, ethical reasoning, health and family planning, gender and women’s rights, and the value of collective action. Jordan Marin had to drop out of school after the third grade. His parents’ poverty forced him into the cane fields during his teens. Through the help of a teacher, he learned English. When he heard about the Free High School, he moved to San Juan del Sur. He was at the top of his class for years. Working at the same time as an office manager for the North American contractor charged with building the new Campus, he helped build it. As a graduate, he has designed his own house, using the concepts of design and sustainability he saw first hand. Now, with a scholarship from the local Brugger Foundation, he is studying to be an architect. After graduation, Estebana Sanchez worked in the Ministry of Education on the adult literacy program, and then came to the Battered Women’s Shelter when it housed four abused girls, to provide a maternal authority figure in the evenings and stay overnight. Estebana and her children all walked many kilometers from the community of Las Brisas # 1 to get to school, starting in the early hours of the morning. In the rainy season students from Las Brisas must cross the swollen river many times. They wade, carrying their school clothes on their heads. We are proud of all of our high-school graduates. All had to work hard to receive the degree–some because they had children and jobs and worked all week. Some had both children and farms to care for; many walked for miles to the bus. Before we found funding for the free bus, they had to scrimp to get the bus fare to come into town. Most, after working all day, had to fit homework in at night in houses with poor lighting where electricity is costly. A significant numbers of our graduates excel even beyond such measures of achievement. Their grades were outstanding. Some go on to technical schools, including our own. When they go on to university they find that they are as well prepared as their peers–an important measure in a country where so many first-year university students, even those from private schools, need remediation. Many of our graduates have taken important steps into the world beyond the diploma. Here are more of their stories. Delia Simon was illiterate in 1998. As a child, her father having abandoned the family, she was raised by a single mother. After going through our three-year literacy program, she entered and finished the FHS. In her final year, for her literacy service, she taught an uncle how to read and write. After graduation, she also chose to participate in the rural literacy program, “Yes I CAN!”, which involved living with a family for eight weeks. (Once that program was completed San Juan del Sur was declared “Free of Illiteracy.”) At age 24, Delia was studying a technical program in Granada. Johanna Cortez ( 2005, a LACA recipient studying Business Administration in a university, UPOLI) now teaches in the Free High School. She is also the accountant for community road projects in the Mayor’s office. Silvia Rios Bermudez, who graduated in 2006, went on to get a university degree in Managua in Communication Sciences. She now teaches Spanish in the Free High School. Aracelys Solis and her mother Concepcion started in the Free High School at the same time and both graduated in 2006. Her mother had washed floors and toilets in the Health Center for many years; after commencement she studied nursing and now serves as a nurse in the same Health Center. 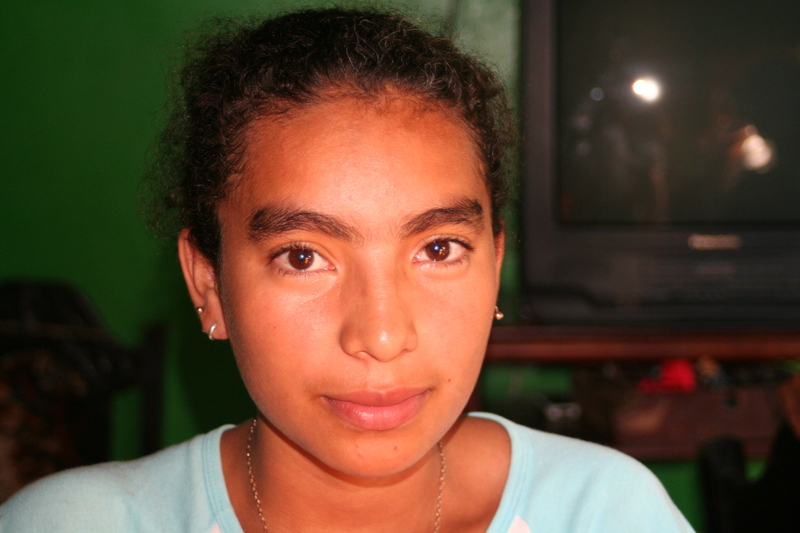 Aracelys had been a single mother at 16 and dropped out. She says her life would have gone nowhere if the school hadn’t opened. Aracelys went on to Ed School out of town; and although she lives in San Juan del Sur, she now skillfully teaches a multi-grade 1-6 (with 22 students) in the rural community of Las Brisas # 1. She told the interviewer that she is in a civil marriage and now has a second, planned child. Raúl Merlos Sanchez, from a distant and impoverished village, who played the guitar and sang with aplomb at the opening of the high school in 2008, won a scholarship to go to Technical School in Venezuela in 2011. In a field of 12 candidates from San Juan and Rivas, he stood out through high grades and the interview. (This also speaks well for the teacher who taught him for the first three years in his village.) The FHS was honored to help him financially with the visa and health exams to make it possible for him to accept the scholarship. Mario Lopez, 43, worked as a kid as a day laborer; then became a mason. Now, as a graduate with the highest grades of his year, he is a student in our Civil Construction program in the Technical School; and at the same time, he supervises and contracts community road projects. A 34-year-old welder said the high-quality math he learned helps him write better proposals. He speaks better; he has more confidence when offering a bid; he gets more recommendations for his work. “You can’t get along without a high-school degree anymore,” Luis Sevilla said. Our highest-scoring student in Tourism, Belkis Guillen, 27, who has organized a women’s cooperative in her village to sell jams that carry a handsome label in English, is grateful to the School because “It has taught me to formulate and promote projects that help in the development of my community and help me be an active participant.” A single mother, Belkis has received a scholarship to study English. Harol Bustos, also in our Technical School, is a tax collector for a community water project. Cornelia Avendaño, who works as the Civil Registrar in the Mayor’s Office, also is finishing her law degree. Maria, 42 years old, had formerly worked in hardware stores. Now the only woman in her year in Civil Construction, she was pregnant, worked as a cleaner and assistant in the church, but never missed a class. José Guadamuz went on to the Normal School out of town to become a primary-school teacher, but on graduating found that the Ministry was providing no placements in teaching that he was willing to accept. He has been hired as an Education Specialist in the local branch of the Ministry of Education. His boss, Dorquis Muñiz, director of Education for Adults, ran “The Battle for the Sixth-Grade Diploma,” one of Nicaragua’s millennial goals. Of the six people working for her, four, including José, are graduates of the FHS. Since much of the work is recruiting rural people who are illiterate or who have few years of education, they–with their own recent successes in overcoming poverty and ignorance–do an amazing job at convincing reluctant adults to become earnest students. Many of our graduates, like Maria and Mario, go on to our own Technical School, while they continue to work– as masons, waiters, house-cleaners; or, in the case of Ernestina Bustos (graduated 2005; now in Tourism), as chief cook for the local Army base. Three out of the four cashiers at the only supermarket in town–coveted positions because of their pay and financial security–are graduates of the FHS. The list could be considerably longer. Some local people of traditional views apparently still think, because so many of our students are poor, rural “campesinos” (one possible translation is “hicks”), that they cannot be intellectuals or as successful as the better-off students from the daily high schools. We do not agree, and we are accumulating the record to prove the remarkable talents and high value of our graduates as citizens, parents, and workers.